On Sunday night, I left Las Vegas. I'd been there for a few days. With the time difference it's easy to work and play out there. The 1st and 2nd rounds of the tournament were Thursday to Sunday, and after taking a look at the sites for the tournament, I decided I wanted to spend my time in Vegas. Anyone who knows me, knows l enjoy Vegas. I like the energy, the sportsbook, the table games, the old friends I have and the new friends I meet. Anyone who's been with me in Vegas and knows me to any real degree, knows where to find me when I'm there. 9 times out of 10, I'm at the Venetian sportsbook. Sometimes you'll catch me at the Hard Rock Hotel, if they offer me a great deal ~ but that's usually when it's off-season for sports and I'm with my girls at the pool etc. Thursday night I said a quick, "Hello" to a guy with which I went to college and medical school. It'd probably been about 13 years. I literally took 5 minutes to make sure we saw each other and give him a hug. Great guy, but I wasn't dressed to go to Tao and I didn't want to crash their party. This trip was business. I was there to watch games and make money. I like it like that. I can spend hours (i.e. literally all day) in the book. I'll watch game after game, and I usually don't change seats once I select my real estate. I'm a creature of habit. If I like it, I do the same thing over and over again. I don't like change. I like consistency. On my second real day in Vegas, I ran to the book to place my very first bet of the day. The line to place a bet was ridiculously long. I wanted my bet though and knew that I'd never make it to the counter in time. I phoned a friend, who was also in town to see if she could do it for me, but she was on a conference call in her room. That's when I knew I had to make a "friend". I saw a guy who looked my age and simply said, "Excuse me." When he looked over, I asked if he'd place a bet for me, since he was closer to the front of the line and I'd never make in time to place my bet before my game went off the board. He asked me what game I wanted and said he wouldn't place it if it went against his bet. I told him I wanted Xavier, and he agreed. When he asked how much I wanted to bet, I said "$330" and handed him $400. The looks on his face and his friends' faces were priceless. They all thought about it for a minute and asked if I thought they should wager some more. I laughed, and they all started pulling money out of their pockets and increased their bet. 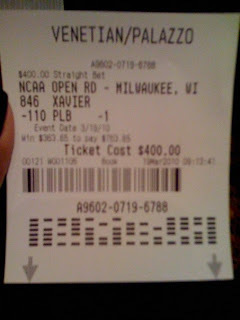 The guy I spoke with asked me if I wanted to put the entire $400 on Xavier, and I said that'd be fine. We all were in play, and we all won. We spent the entire day together starting from about 8AM til the last games went off the board. During the day, I learned from Vegas Dude (i.e. that's how I put him into my phone, but he wants to be referred to as PDX, so I will indulge him on that going forward) that there were 4 of them in town together and they were taking shifts staying in the sportsbook seats. Someone in their group was in the seats at all times and they had various shifts late at night to keep the seats reserved. These were my kinds of guys. They adopted another guy named, Josh, and the 6 of us were thick as thieves the entire weekend. Actually Josh was gone after Saturday night... Josh kept telling us he had friends in town, but I joked that it wasn't necessary for him to make up stories since after about 48 hours together, we were all like family. Friday was a great day and night. It was so much fun going over our bets and seeing how much money we could take. Living and dying with every last minute shot, jaws dropping when presumed blowouts ended up as buzzer beaters, and taking advantage of an open bar (i.e. no drink tickets necessary). After the final games ended, it was time to take my winnings to the tables. I like craps. I support my craps habit, with my sportsbetting. I can win $800 and blow $400 of it and not care. It's all gravy and it's fun. Friday night, PDX and I ran over to the Mirage to chat it up, to eat dinner (i.e. there's nothing like meatloaf and mashed potatoes late-night for comfort food), and to play a little craps. I played craps, tried to explain the game, and he watched. We had a blast! I turned $200 into $275, but that didn't really matter because a win is a win. Next stop was some bar/restaurant over at Mirage for a drink. We both threw $10 into a video poker machine and we played blackjack. Three clicks later, we had $40 and cashed out. I like to hit and run when I play silly games like that. It's money in the "bank" that we put to the bar bill. Next stop was Bill's Saloon for rapid craps. While waiting for 2 seats at the rapid craps table, we played the $20 each on the "Wheel of Misfortune". PDX decided, we'd get 5 spins each and the winner take all. I was losing, and he caught me taking some of his chips. Whatever. I think I took $4. We laughed. Once we found 2 seats next to each other, we hit the rapid craps table. I did my best to teach PDX about $5 craps, but by that time of night it was a challenge. He ended up rolling a 7 on his first roll (i.e. winner)... Craps virgin roller luck ~ it's beautiful! He had a blast rolling the dice. He set his point and made it. He had technical issues with his working the terminal for his bets, and once I took control, it was too late. We both started with $100. I think he left with $30 something... I don't really remember. I know I left with $200+. I'm lucky and had a great night. We established a curfew and left Bill's around 2, since he had to get some rest before heading down to the sportsbook for his shift (i.e. someone had to man the fort so we'd have seats). 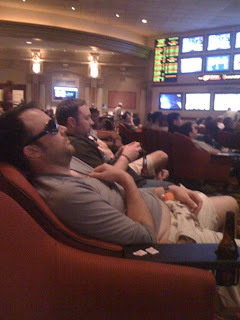 We headed back to the Venetian, and I thought about playing some more craps since I was up and not tired. However, I decided against it, since it was late, PDX already bailed, and I wanted to save my money for the next day. Sunday was the last day in the book and it was a rough one. Everyone was tired. I had to grind it out. Live and/or die by the parlay, and I was hemorrhaging my profit money. Oh well ~ I tightened up my game towards the end of the night, and salvaged the day. Before flying out, I said goodbye to my teller/dealer friends in the book and the old man, Shane, that was sitting next to me (i.e. since we were both on the Hawk's side against the Spurs). Shane and I laughed it up and commented on the Tiger Woods' interview that monopolized the TVs during the commercial breaks. We both decided we didn't really care and that it looked like Tiger had cried before the interview. Shane thought Tiger had "rubbed onions in his eyes". I laughed. I like Tiger, but come on. Enough already. 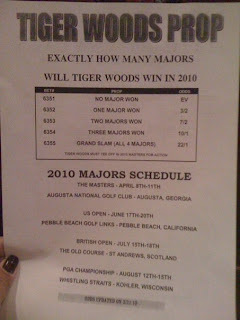 For those of you that are curious here are the prop bets for Tiger's return to golf. 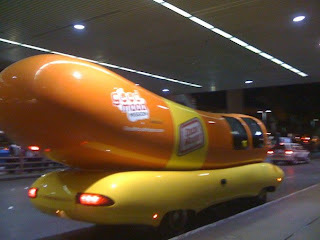 On the way to the airport, I noticed my cab was following the Oscar Mayer Wienermobile. 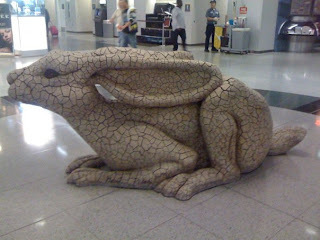 Yep, it was defintiely becoming surreal. Time to come home. They were passing out whistles ~ I got one. It's definitely time to get out of town. Today was the first day in a few where I didn't wake up and head down to the sportsbook to meet up with PDX and the guys. After spending so much time with them, I must admit ~ I miss them already!